When it comes to energy, who doesn’t absolutely live for that exhilarating feeling of jumping out of bed, motivated to dive into the day while buzzing with the energy and optimism?! The problem is, that feeling doesn’t strike most of us every day; with long work days, family needs and other obligations, it’s often all we can do to keep ourselves going morning after morning. In many ways, energy and motivation are a habit – something we cultivate, even when we don’t “feel” like it. When we’re deeply connected to our “WHY” in our life and work, for example, we can use this to fuel our morning rituals and instigate the energy we need to make each day our masterpiece. But for many people, it’s a constant intake of coffee, sugar, and other addicting substances that fuel the energy needed to power through full days. Ironically, these poor nutritional choices create a vicious cycle that demands more of the unsupportive substance just to maintain a “stable” level of energy. Nutritional choices can make or break our energy levels, but the good news is that your body is wired to respond positively to nourishing foods, and heal quickly from the addictive damage of sugar and caffeine. We’re not talking about those colorful gummy candies you sneak in after lunch to beat the afternoon crash… This rainbow is made of the the gorgeous, natural colorful foods that this amazing planet has so generously provided for us. Perhaps unsurprisingly, the most richly colorful foods are the ones that will pack the most nutritional value – and energy. To put it bluntly, if you want more energy, you must cut out the sugar and processed foods. While it’s easy to reach for a pack of cookies or a vanilla latte after lunch, engaging in this cycle increasingly damages your vitality, immunity, and energy levels. That’s not to even mention the hoard of unpronounceable ingredients present in most packaged foods. You are built to thrive on WHOLE foods – foods with one ingredient. Whole fruits, vegetables, grains, and seeds are packed with vitamins and nutrients to give you energy naturally. Packing your diet with fruits and veggies will give you sustained energy, because these foods are light in calories but full of fiber and nutrients. And how could you not want to dive headfirst into a gorgeous and colorful pile of carrots, beets, kale and mango?! Trust me, once your body gets used to thriving on this natural rainbow of goodness, you won’t even feel like going back. Whenever possible, go for rainbow foods over white/yellow foods or paler colored foods. Think dark leafy greens over iceberg lettuce…. Sweet potatoes over white potatoes…. Carrots and beets over corn… brown rice or quinoa over white rice. Sure, it’s fine to enjoy the starchier foods, in balance – while keeping the colorful whole foods as the priority in your diet! It’s almost too simple to be true – so lots of people overlook the fact that their energy is draining because they just need to drink more H20! And as a result, they reach for foods to lift their energy, when water would do the trick. Take a look at your water habits, and recognize that chances are pretty high that you’re not getting enough of it. The average person needs about 8 cups per day, or 64 ounces – but shoot for more. Often times when you feel hungry – it’s water that your body needs. And if you are someone who insists on their morning cup of joe, mindfully increase your water intake, as coffee is a diuretic. Focus on spacing hydration throughout the day. Drinking a ton of water at once isn’t going to do much, as it’s just going to leave your body quickly. Sip throughout the day, rather than chugging your 64 ounces all at once and calling it a day. Also – hydrate your body first thing in the morning for a great energy boost first thing. Warm water with lemon and a some herbs like triphala or turmeric powder is incredibly nourishing early in the morning, and the earth element of lemon + herbs will help your body absorb the water more easily than just drinking water alone. And drink your water room temperature, when you can, as opposed to chilled. No, it’s not as satisfying on a hot day, but your body will absorb it much more easily this way. Add all to blender and BLEND AWAY! Blending your greens helps your body absorb them much easier than eating them raw. While eating a spinach and kale salad is obviously great, you really need to focus on chewing the greens fully to absorb them. 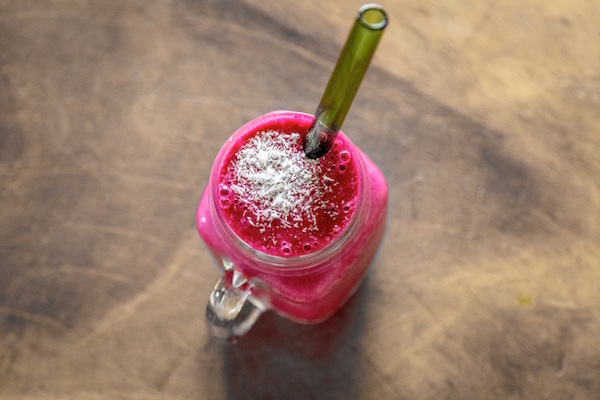 But in a smoothie – just pulverize those bad boys and you’re good to go! Vitamins and nutrients right down the hatch. Definitely don’t try to replace healthy eating with vitamins – your body is designed to absorb the vitamins from whole foods first and foremost. But ensuring you’re getting everything you need with vitamin supplements can help fill in any gaps in your diet. Green tea is packed with antioxidants and gives you a much more natural energy boost than coffee, as its caffeine levels are much lower. It boosts metabolism and will give you a gentle energy boost without the crash of coffee, throwing you into that endless loop of needing more. I recommend Sei Me green tea powder if you’re on the go, which deliciously dissolves in hot water, or is easily mixed into smoothies. Otherwise, experiment which the green tea variety that works best with your taste buds. Drinking tea in the morning is a gentle morning ritual that awakens the body and will prepare you to start your day focused and awakened. Remember that your body is your playground, and different foods and nutritional experiments can be used as a fun game, to see what best optimizes your unique energy. Take what works and leave what doesn’t – and let us know in the comments below what works best for you!